Isabelle is a rare creature, a duchess by birth, rather than by marriage. As such, she, along with the unmarried dukes, are being pressured by the Prince to marry immediately. 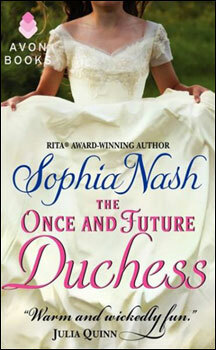 Though she’s young (only eighteen) she’s mature and has been in love with James Fitzroy, the Duke of Candover, forever. She decides that she will take one shot at happiness, and propose to James, choosing to make it sound like a logical union, with no mention of love. While James knows that Isabelle is fond of him, he is shocked at her proposal, and turns her down as gently as he can. Though he has feelings for her, he has secrets, and has made promises which won’t let him marry her and also keep his word. Now resigned to a loveless marriage, Isabelle begins the search for a husband. As James watches her, it slowly kills him, although he firmly believes he can’t have her for himself. James and Isabelle were such wonderful characters. James is always putting duty and honor first, trying to meet everyone’s needs, while feeling unworthy. Isabelle is so much in love, and it’s agonizing to watch her joy die a little more each day as James becomes farther out of her reach. James watches this happen, and realizes that she is building walls around her heart, just as he has. The author, Sophia Nash, took this happy ending right down to the wire. I have to admit that I was beginning to have doubts, myself, that things were going to turn out right. I found this to be an emotional and very satisfying read, and I highly recommend it.